Ifttt.com is a web plumbing service that connects multiple web services together to create services that are much more useful than those individually are. Ifttt.com stands for If This Then That. It essentially creates a macro environment for web (à la macros in MS Office), enabling knowledge web workers to automate tasks across web. Given the workforce in Enterprises are increasingly populated with Gen Yers, such web plumbing services have an important place in the future of Enterprise IT. It provides basic constructs to monitor and evaluate an event and then take an action on the same. To show how this service works, please see the screen grab below. 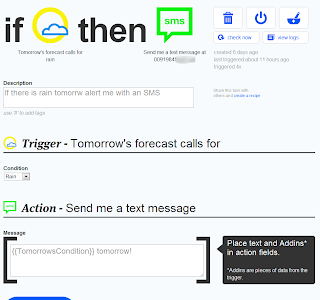 This graphic shows a Task which sends an SMS alert if there is Rain predicted tomorrow on Weather.com. As can be seen in the graphic there are two simple constructs Trigger and Action. There are predefined channels which can be used to define the triggers. In this case Weather.com is used as the channel and the trigger is “Tomorrow forecast calls for Rain”. Action is defined as an SMS message, which another pre-defined channel with my phone number attached to it. Ifttt.com runs this task every 15 minutes and checks if there rain is forecasted tomorrow and then sends an SMS alert. That is how simple using this service. The user interface is barebones and is very simple and easy to use. One doesn’t need to have any Programming background to use. But don’t let the simplicity undermine its power. As Douglas Adams quotes in ‘The Salmon of Doubt: Hitchhiking the Galaxy One Last Time’, “The future of computer power is pure simplicity”. Under the hood of Ifttt, REST APIs and RSS Feeds are hard at work. These technologies enable easy programmable access to various web services. Another important, but often overlooked technology that forms the technological foundation of Ifttt is OAuth. OAuth enables token based end user authentication and authorization between multiple web services. Ifttt.com is not the first service to attempt web plumbing. There is a great service called Yahoo! Pipes, which probably started the idea of web plumbing. Yahoo! Pipes is very visual with a graphical interface reminiscent of popular WISYWIG image editors. Yahoo has done a great job in abstracting the complexity of REST APIs, RSS feeds as visual widgets that can be dragged and dropped. Unfortunately the service couldn’t get the traction with masses, however is quite popular among web geeks and programmers. It doesn’t take much imagination to see how useful web plumbing (in specific ifttt.com) can be in Enterprises. Enterprises have been trying hard for a long time to seamless integration of internal IT services. Years ago Enterprises have embarked the journey of Service Orientation Architecture, but are yet to reach the distant dream of seamless integration. Adoption of cloud SaaS services have only made reaching the dream harder. Given how ifttt.com has brought web plumbing to masses, there is lot of speculation that ifttt.com is pursuing Enterprise Interests. Recently ifttt got a funding of $1.5 million, not bad for a two person company. Can’t wait for an Enterprise edition of ifttt.com. Cloud Integration Platforms are already rage in Enterprises. To name a few, IBM’s Cast Iron and Dell’s Boomi are already heavy lifting the integration between on-premise services and SaaS service hosted in the cloud. SnapLogic (www.snaplogic.com) is another interesting Cloud Integration Platform. It has pioneered the use of App Store for its cloud integration platform. However, all these platforms are targeted towards the IT developers and not the Business Users. One day, I hope these services learn something from ifttt.com.